Taking to the bridge deck of your superyacht may require one of the best modern sailing watches but for time spent on your private jet only a pilot's timepiece will do. And if you're taking the controls yourself then there are certain key things to consider. 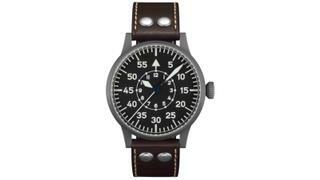 Above all else a pilot's watch must be accurate so if you're buying mechanical it's important that your chosen timepiece has a chronometer certification. Timepieces used at altitude should also be resilient so look for something in titanium, steel or ceramic with scratch-proof glass and large, highly visible hands and numerals. And as for style? The bigger and bolder the better. From the latest limited edition watches to enduring classics, here are the best pilot's watches to buy now. A long-standing aviation essential, Breitling’s durable timepieces are designed to accompany pilots on their most challenging missions. The Navitimer 8 Automatic is a direct descendant of celebrated Breitling watches from the 1930s and 40s. Inside its stainless-steel case – which contains a rotating bezel and pointer – the Breitling Calibre 17 delivers more than 40 hours of power reserve with its bi-directional rotor winder. It is now more than a decade since Bremont sold its first watch, and the range of aviation-inspired pieces has grown to include more than a dozen models. Debuted in 2017, the elegant Airco Mach 2 is a 40mm chronometer featuring polished hands and numerals and the brand’s hardened steel Trip-Tick case. 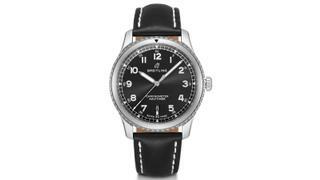 Louis Bleriot wore a Zenith in 1909 when he first flew over the English Channel. 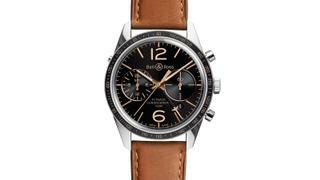 This retro version of the Type 20, with a 45mm bronze case, giant “onion” crown and accurate El Primero movement, would have suited the cockpit of his flimsy aircraft. 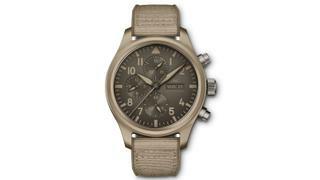 Bell & Ross made its name with its square-cased Instrument watches inspired by the gauges on modern fighter jets. This, from the more traditional Sport Heritage range, features a flyback chronograph that is stopped and reset with a push of a button. 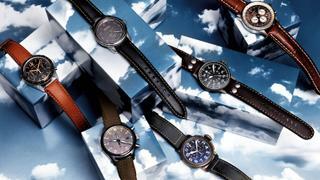 Laco watches, made for Second World War pilots and navigators, have become highly collectable. The German brand still makes models that are virtually identical to the originals, such as the quartz-powered, 42mm Paderborn and several versions with mechanical movements in case sizes up to 55mm. 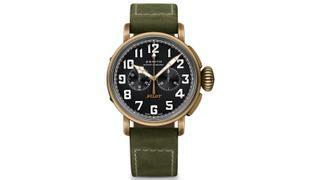 This modern, 44.5mm version of the 1930s Big Pilot’s Watch gets a military-inspired twist in this limited edition featuring a scratch-resistant ceramic case and desert beige strap. 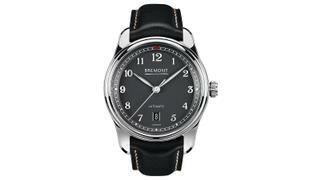 The in-house movement is protected from magnetism by a soft iron cage and has three easy-to-read chronograph subdials. 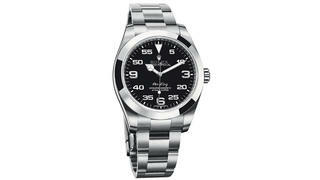 The all-new Air-King features a 40mm case (up from the old one’s 34mm) and some vibrant Rolex green detailing. “Air-King” is written in the brand’s 1950s font and the dial layout is in the form of a “3, 6, 9” configuration, with a prominent minute scale intended for navigational time readings.